During the late 1800s and early 1900s Old Lyme CT became a summer art colony favored by American Impressionist painters. Miss Florence Griswold befriended them, and they painted for her. In the early 1900s, many talented American Impressionist artists gathered in Old Lyme CT and boarded at the fine old (1817) late-Georgian mansion of Miss Florence Griswold on Lyme Street. This "School of Lyme" experimented with Tonalism, then progressed into Impressionism. American Impressionists whom Miss Griswold admired, including Charles Ebert, Childe Hassam, Willard Metcalfe, Henry Ward Ranger, and Guy and Carleston Wiggins, decorated many of the mansion's walls and doors with their work—sometimes in lieu of rent. Today, the museum's collections are housed in two buildings, Miss Griswold's mansion and a fine modern gallery building behind it. 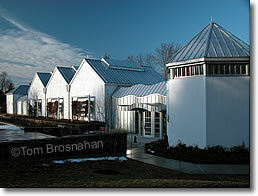 Exhibits cover the history of American art from the 1700s to today, specializing in the art of Connecticut. Prominent artists include the colonial painters Ralph Earl and Ammi Phillips, Hudson River School masters Thomas Cole and Frederic E Church, American Impressionists Childe Hassam, Matilda Browne, Willard Metcalf, and John Henry Twachtman, and 20th-century masters Joseph and Anni Albers, Sol LeWitt and Walker Evans. The modern museum building behind the mansion. 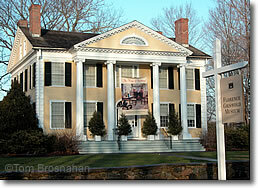 The Florence Griswold Museum is open daily except Monday, closed on major holidays. A moderate admission fee is charged. From I-95, take Exit 70 ("Old Lyme") and follow the many signs to the museum. now the Florence Griswold Museum.